See Full length feature here for child who has had his bowel removed thanks to MMR. My life was destroyed by the MMR. Jamie Wiseman Adams. My son had MMR shots when he was 2 1/2. I put it off a little bit for some reason or another. He received them at the Bear Run Clinic in Orange Park, Florida. He screamed and cried the whole ride home and that night he started banging his head into the floor!!!! He was a totally different kid and stopped everything he had learned. He never was unaffectionate towards me though but immediately developed autistic like behaviours, especially echolalia and adhd. He ran a high fever and developed some kind of rash looking thing on part of his chin! Years later I learned he had a major allergic reaction to the toxins in the vaccines. I wrote Tallahassee Vaccination whatever they're called and they wrote back saying basically 'we're sorry but the vaccinations help more kids than they hurt.' He went most of his life being misdiagnosed because Dr's didn't have a clue about autism. Finally at age 13 he was diagnosed with PDDNOS, tourettes, echolalia, adhd, and sleep disorder. It doesn’t take a rocket scientist to know you DON'T GIVE SO MANY SHOTS IN ONE DAY TO A TODDLER. Heather Adel My son started having seizures after his one month MMR. They were occasional and everyone tried to make me think I was losing my mind and imagining it. I did not want him to get two month shots but the dr talked me into it and that night he had 40 seizures in my arms. Every day after that he had 7 or 8 seizures that lasted 10 minutes at a time. He is on heavy doses of Topamax to control the seizures, which I think he started having seizures while I was still pregnant and on Reglan. At 8 months along, I changed OB-GYN and they immediately took me off the REGLAN and I was able to carry him full term but had been having contractions prior to switching dr's. Then when they immunized him it triggered something and they told me he would not live to be 5 and be mentally handicapped. He is making his milestones and shocking all the dr's. Nobody knows what exactly is wrong with him. He is still on high doses of Topamax and without it he is a limp lifeless baby. With it he is achieving miracles. I have not allowed them to immunize since his two months immunizations and I am so scared to do so especially with all the stories out there. He is my 4th baby and all of my other children, all girls, have been immunized with no problems, but something about my son is different. They have already started saying he will be on the spectrum and he is 2.5 years old. I really feel like there has to be other moms who had REGLAN while being pregnant and their children are autistic. Just like the Thalidomide Babies there was over 8000 babies born with deformed limbs etc., before they realized the cause was something they took during pregnancy, I will bet my life that Reglan is causing Tardive Dyskensia which is being misdiagnosed as autism. Jenny Allan Vaccine MMR: injection arm Location London Date of administration December 2003 (age 12 months) No immediate reaction noticed, but it might be significant to note that Chris had recently been ill with a respiratory infection and had been prescribed antibiotics. There was a very marked change in Chris's behaviour over the following few months. He stopped 'engaging' with adults for 'play' sessions and became uninterested in books (VERY interested in both before the jab.) He lost the few words he had acquired. He had always been an 'easy' baby, happy, sociable and content, but changed into a screaming, challenging infant who seemed to be in pain a lot of the time. Chris's MMR administration was 1993. He is 18 now!! Anna Maria Angelosanto My daughter Aly was 13 months old when she received her MMR vaccine - a day later, she had a fever of 104, loss of speech, toe walking, no eye contact, body rash from head to toe like I'd left her out in the sun to bake, and vomiting then at the age of 5 she had to get her Diphtheria and Polio shots together and that night she had a high temperature, vomiting and diarrhea, she started babbling like a newborn, regressive behavior, etc. I will never give her another vaccine or flu shot her immune system cannot handle it - we are from Rhode Island. Today, she is trying to talk a bit more, has better focus, great eye contact all with the help of ABA, school, natural supplements like Cod liver oil, vitamin D3, probiotics. 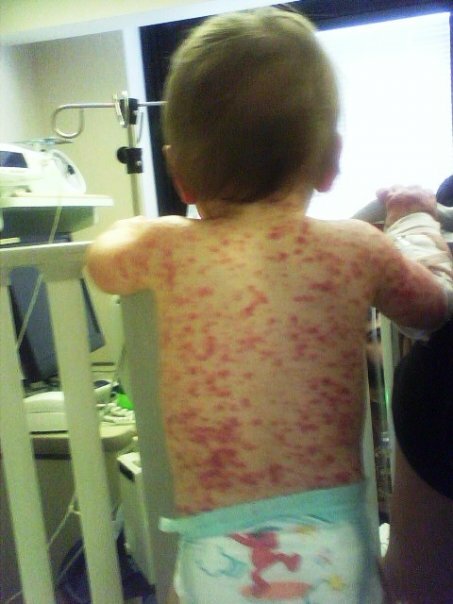 Cheryle Wallace Annese MMR daughter - severe purplish reaction head to toe. There was probably an inch total of skin color showing. The dr. said if you watched it closely you could see it moving. Another daughter took over said it was something else and we didn't see that dr. again during our visit. Nice cover up. My son - I went by the book, obeyed every order from dr. god. He was sick every winter with ear infections. Daughter has ADHD, my son is the one who is Autistic/just though I would share. If ever needed I have pictures. Dawn Ashby My son was a normal child until his 12 month old vaccinations in Waco, Texas (2004). He got many shots during the visit including MMR. He immediately stopped talking, interacting, laughing--became non-responsive. He was tested for autism a few months later after no improvement--was diagnosed with Sensory Integration Disorder. We had 2x a week speech therapist appointments and did daily activities (including heavy lifting). With about 2 years of constant therapy and working with him, he has mostly overcome his obvious problems. He still has a variety of issues (he has many phobias and his body is very stiff) but, overall, is able to pass for "normal". Sofia Backlund MMR vaccine Got VERY sick after vaccine and stayed sick for 7 mnths, ear infections etc got 7 rounds of antibiotics back to back. Diagnosed Autism 1,5 years later. Vaccinated in Boynton Beach, FL USA. Today: after 4 years of biomedical intervention he is much better, he is in a regular school, he has friends but he still have some social issues and narrow and limited interests. Cheryl Bailey Vaccine damaged. starting with Dpt took his physical skills, MMR blew his guts to bits and left him with failure to thrive and seizure disorder rashes, hair fell out, vomiting, leaky gut, loss of remaining physical skills including speech, eye contact, even the ability to open and close his hands, feed himself, crawl. In my book when you take a healthy child and destroy his body and ability. It's called Damage. Now 18 it's been a long 16 years people. Location, Mississippi. Becky Barnes Patient Andrew Barnes My son ran a fever after his MMR. He had a hard patch on his leg where the shot was given for over 6 months. He gradually submerged into green/yellow diarrhea and autism. He was 10 pounds at birth and was ahead of every mile stone until that vaccine. The GI doctors refused to even test the stool samples. When he was 6 we discovered (through our DAN! doctor) that he had Hypogammaglobulinemia. We have to fly him to California (from Central IL) for diagnosis and treatment. We have had two immunologists tell us in the office that they will help us only to have an office staff person call later and basically asked us to go away. The vaccine was administered in Normal, IL in 2002. Sherry Bass Michael-My eldest grandson seemed to slip away a bit and recover after each vaccine until he received the MMR vaccine @ 16 mos. Within a few weeks he had full bore Autism. He was scoped by Dr.Krigsman and found to have bowel disease as described by Dr. Wakefield. He is in 5th grade and is doing well thanks to DAN!, Dr. Wakefield's research & Dr. Krigsman's treatment of his bowel disease and a dedicated team of professionals at our school. He was vaccinated in NY. Aiden-My middle grandson was given vaccines on an alternate, slower & spaced apart schedule. He had seizures after DTaP vaccine at 8 mos. No vaccines were given for a yr. and then slowly & spaced. At 3 yrs. old he began HepB series. He began symptoms after those vaccines. He was diagnosed at 4 1/2 yrs. old w/ a mood disorder, motor disorder and has Autistic tendencies and traits. His diagnosis is about to be changed to PDD-NOS. He is in kindergarden w/ 1:1 aide, IEP and many supports and therapies. He struggles everyday. Vaccinated in NYS. My son Ben was born 1/7/98. He had the Hep B vaccine at Jefferson Hospital in Philadelphia, PA. He went failure to thrive. After every round of vaccinations given in Haddon Heights, NJ, he became sick with nasal infections. After his 15 month well baby visit where he received the DPaT, Polio, Hib and MMR he lost all skills and later was diagnosed with autism. Today he suffers from dyslexia, auditory processing disorder and PDD-NOS. Ben has not received any shots since 15 months; he is 13. Katie Novarro Beecher I am sorry this is not very complete information but I am good friends with two families whose children exhibited regressive behaviour after MMR vaccines and are now autistic, according to numerous conversations we have had. One child, a girl, is now 13 and the other, a boy is now 17. They are both in Connecticut. I have personally spoken with parents of at least three other children in the last year. I hope a lot of people respond to your request. These parents need to get together to educate the so called scientists and doctors. Tre Benson MMRV at 12 months, fevers, seizures, loss of language. 6 months later the dx. Colleen Berkery I have 2yr old twin boys that were evaluated @ 13months NOV 2, 09 by EI due to being premature they were perfectly fine & actually ahead of schedule. They got their Flu shot in Dec 2009. MMR & Hep shot on November 18, 2009 by January all speech was lost both started extreme tantrums, tip toe walking, self injurious behaviours & stimming. Each day they both were slipping away more & more. They were revaluated in March 2010 by "EI" AGAIN & were said to have Sensory Integration. I knew it was more than that & searched everywhere for help only to get the response they are too young to know. In July 2010 they were both diagnosed at the "Drexel Autism Center" in Philadelphia PA with Autism with a GAF level of 10. We live in suburbs of Phila PA.
Rebecca Bonaparte I had a typical child he was given MMR & men. C. conjugate while running a temp (doc prescribed antibiotics that day!) and that's the day I lost my son to Autism. Happened in Cornwall, Ontario. Francesca Montesinos Bracho I am so happy you are doing this work. My son was adversely affected by the MMR. Carol Brannaka I personally HATE MMR-I remember when my son got sick...so incredibly sick....he pays for that shot every day of his life Watkins Glen NY..
Marlene Burkitt. Alex, my "autistic" son was born Sept 1994. I had a gut feeling, not good, about the Hep B shot and also MMR given before age 15 months since my 3 older boys born 1972-1980 had 1/3 as many shots and MMR was added after age 15mo or 24mo. Each round of boosters I noticed worsening of his symptoms with very slow recovery over time and supplements. July 2009 I allowed only DTaP booster as he won't wear shoes except when forced to, shortly after that booster he had a bad spell of behaviours resulting in property damage at school, assaults on students and staff and he was sent to ED school as he was deemed too dangerous for regular high school. He is verbal HFA, grades vary mostly Fs this past year after his DTaP booster. I refused the 3 other recommended shots. He is mostly "recovered". Most were in Roseville California (Kaiser HMO), but he had 4 shots all at once in Citrus Heights California, a government free clinic when I had a short period of no insurance. My niece went into the Air Force certified healthy. After just a month in Kuwait, she developed unexplained pain everywhere, now diagnosed with fibromyalgia and gluten sensitivity. Hard to know which vaccine she got was to blame though, as she also had a lot of amalgam dental work just before deployment as well. She was released from duty on full medical disability discharge when she was only 25 years old. She just turned 29 and she is still suffering. Tina Vairo Byrnes MMR. my daughter lost eye contact, cried all day, stopped eating, couldn't be touched, hypersensitive hearing, stopped walking, stopped talking, stopped sleeping. We're from new jersey.